at the base of a tree well. CONCEPT: Buffie Clark is an amazing woman. Her life, person and art inspired the form and shape of this house. She is constantly redefining herself through her art and her expression of living. Her upbringing was rigid and girdled in society. She exploded within these limitations and gracefully moves through these grids of her past in a fluid, artistic expression. Her life and art developed within a square model, and she has become a fluid individual who needed a dynamic space within familiar constructs to work and live within. The style of the house is Japanese, and the tatami ratio was used throughout the design. 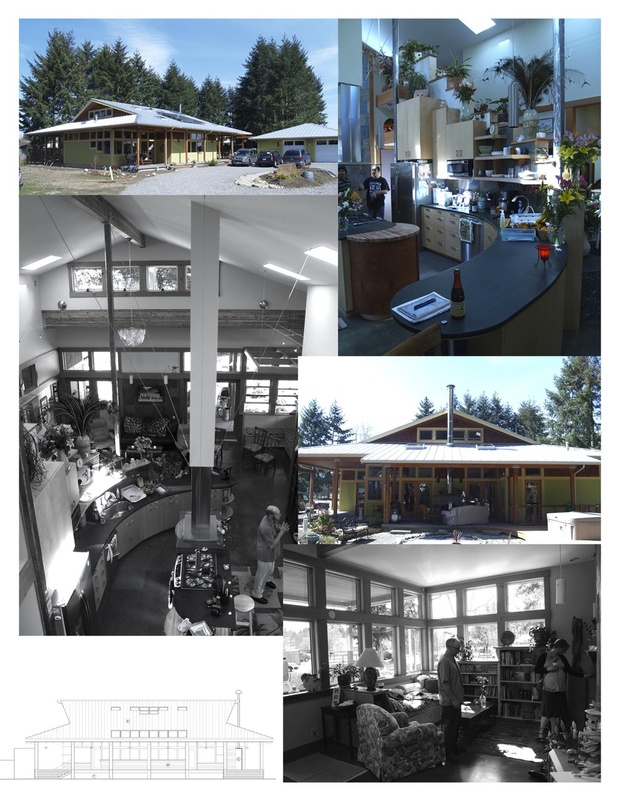 SUSTAINABLE ELEMENTS: Pete Chrameic was the builder. He and Buffie chose local artists and specified as many local materials as possible in building the home. There is a PV array on the south roof which provides all the power used, except in peak hours. All rain water is captured and used for irrigation. All paints are low VOC off gassing paints. Radiant floor heat is supplied through a high efficiency boiler. All plumbing and electrical fixtures are high efficiency, including dual-flush toilets, and a tank-less water heater. 90% of lumber used was FSC certified. 90% of trim and finish material used was recycled fir. The fence was manufactured out of the trees that could not be saved during construction. Each process of building was executed with as much consciousness to energy consumption and end use.